It begins with a plea from a desperate mother. "Please help me. My family is being haunted. I have nowhere else to turn." 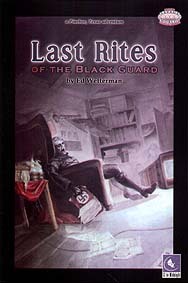 Last Rites of the Black Guard is a modern ghost story for the Savage Worlds RPG. Set in a middle-class home in an unremarkable subdivision, your characters investigate poltergeist activity that has left a family frightened and on the edge of reason. One terrifying encounter follows another, leading you to discover that even the dead can be haunted. If you and the family are to survive, you will have to confront an ancient malevolence given new form.